2018 marked the 75th year for the Golden Globes, and people are still talking about it, mainly due to the rousing speech Oprah gave during her acceptance of the Cecil B. DeMille Award for lifetime achievement. But that wasn't the only memorable moment. In particular, James Franco gave the industry a shock when he beat out big names, like Steve Carrell, Hugh Jackman, and Ansel Elgort, for his role as Tommy Wiseau in The Disaster Artist, taking home the Golden Globe for Best Performance by an Actor in a Motion Picture, Musical or Comedy. For the uninitiated, The Disaster Artist is based on a book of the same name that follows the making of Tommy Wiseau's 2003 film The Room, which is often considered one of the worst movies ever made. For many today, The Disaster Artist was their first introduction to Wiseau's cult classic, but it's long served as a clear example of how not to write a movie. Would The Room have been better if it was written with Final Draft 10? While we’re not here to criticize Tommy Wiseau’s creative genius, sometimes a good movie can be decided by the very software you use to write it. And, had more attention been paid to story-mapping and collaboration, The Room may not have needed James Franco’s involvement to reach mainstream audiences. This takes us to Final Draft 10, which is the world’s number one screenwriting tool. Utilized by studios like Disney and Warner Brothers, this program has helped draft countless successful, big-name screenplays. And, with licenses on sale for half off their usual price, we thought now would be a good time to highlight three reasons why you should be using it to draft your next motion picture. Take a look at its features and decide for yourself if this Hollywood-approved tool could have changed The Room's fate. A story without a roadmap is a like a roller coaster without brakes: It’s a chaotic and scary mess that’s sure to end in disaster. Final Draft 10 boasts two new features that allow you to plan your stories and make sure your ideas line up from start to finish. First, Story Map™ lets you outline acts, scenes, and sequences more efficiently. 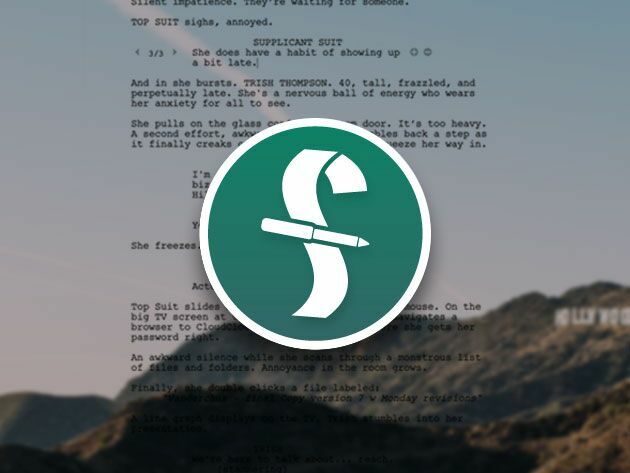 With Story Map™, you can keep track of your narrative arc by marking Structure Points, which allow you to plan and track tentpole moments of your screenplay. Combine this with Beat Board™, and you have a reliable way of keeping your plot and character arcs coordinated. Say you need to deduce where a character is emotionally in your piece, just add a beat at a pivotal moment, and you have a clear indicator of his or her development. In case you weren't already aware, drafting content is a long and often tedious process, so it pays to shave off as much time as you can during the writing process. Final Draft 10 helps you do this by providing you with more than 100 templates for screenplays, teleplays, and stage plays. Each template includes industry standard title pages, which are streamlined and simple to modify, save, and print. When combined with Final Draft 10's other quality-of-life improvements, like automatic Hollywood-standard pagination and backups, you can grind through your next piece at a much faster rate. As the old saying goes, "Two heads are better than one," and this rings true when it comes to drafting a screenplay. Whether you're looking for ideas on how to improve a particular scene or just have someone peer-review your work, Final Draft 10 affords you the ability to do so from anywhere. With Final Draft 10, you can work on your script remotely and in real time with your writing partners, allowing you to share ideas and talk business without having to hassle with phone calls or meeting in person. That way, you can focus more on producing quality content in the environment that's right for you — even if that just means wearing pajamas in the comfort of your own home. Global Name Changing: Sweet Christmas, how miserable a time it is when you need to edit a character's name late in the game. Final Draft 10 lets you edit a character’s name in script elements like dialogue and action and keep the appropriate casing without using "find and replace." Dictionary and Spell-checking: Part of what made The Room such a beautiful disaster was its questionable use of the English language. Thankfully, you can keep your film from going down the same path with Final Draft 10's included dictionary and spell-checking tools. Dictionaries are available for 12 languages and even offer country-specific spell-checks. Alternate Dialogue: Writing natural, convincing dialogue is tricky, and often you'll find yourself drafting multiple lines for the same scene. Final Draft 10 lets you store alternate lines of dialogue within the script itself. That way, you don't have to flip between pages or navigate through cluttered lines to see which options are available for a given scene. Revision Improvements: Finishing a script is but one part of the movie-making process. When it comes to bringing your story from page to screen, you still need to revise your script. Final Draft 10's revision mode allows you to track and review the changes you make at every step. Plus, you can set your revision colors to keep things coordinated and merge pages even when your script is locked. Watermarking: If you're going to spend hundreds of hours working on a screenplay, you'd best make sure you protect it, too. That's why watermarking your work is a must, and with Final Draft 10, you can secure your script by identifying each recipient with a custom watermark. 2003 happened, and The Room will remain a cult-classic and clear indicator of how drastically the screenwriting process can spiral out of control. However, it's a new year, and you can start yours off right by taking the appropriate measures to ensure your screenplay is organized, streamlined, and polished to near perfection. Final Draft 10 usually retails for $249.99, but you can get it on sale today for $124.99, saving half off the usual price. Plus, take an additional 15% off with FD15 at checkout.